Polar bears become mature at the age of 3–5 years. Mating takes place between mid-April and late June. When the ice begins to melt and the days get longer, males start searching for mates, travelling long distances. Polar bears are mostly solitary and a couple stays together only for a week. Then the male leaves and starts hunting for food or looking for a new mate. Preparing for the birth of her cubs, the pregnant polar bear builds a maternity den in October or November. With her powerful forepaws she digs a one- or two-chambered cave in a snowdrift, with a tunnelled entrance usually looking south. Entering the den, she closes the tunnel mouth with snow and makes a ventilation hole through the chamber ceiling. When there is little snow, the bear may dig a den in the earth. As a rule, the mother polar bear gives birth to one or two cubs in December and nurses them in the maternity den until spring. A female polar bear can produce five litters in her lifetime, which is one of the lowest reproductive rates of any mammal. 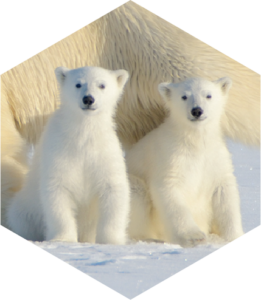 Newborn cubs are 30–36 cm long and weigh about half a kilo. They are almost hairless, their eyes and ears are closed. At birth their skin is pink but gets black while the fur is growing. Thanks to their mother’s fat-rich milk, the cubs grow quickly. In March and April the cubs are strong enough to leave the den. The mother emerges from the den with her cubs and does not return there. Having used up her fat reserves during the long fasting time, she goes hunting for seals to gain new strength for taking care of her young. Once the cubs have left the den, they follow their mother everywhere. They remain with her for roughly two years, during which time she must teach them all the skills needed to thrive and survive. By two to three years of age the young polar bears have acquired enough experience to start living on their own. *Indoor exhibitions are closed on Mondays. You are allowed to walk in the Zoo for 2 hours after the Ticket office is closed. Bus stop: Zoo, buses nr. 21, 21B, 22, 37, 41, 42, 43; by car, bicycle or walk. Bus stops: Nurmenuku, Karikakra or Meistri, buses nr.10, 12, 16, 26, 27, 28, 37, 41, 42, 43 ja 45; by car, bicycle or walk.